of sharing the fun of model trains. 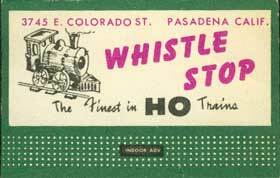 What has become one of the best-known model train specialty stores began as a small gift and hobby shop on the very eastern border of Pasadena in 1951. In those 50 years, the business has doubled in size, expanded to a second location, split up and become one again, moved its location, survived earthquakes, earthquake retrofitting, been flooded out, struck by lightning and gone cyber. Throughout all of this, we believe we’ve become a success in our field because those who work here, and the many who have worked here over the years truly believe that model trains are fun, and that sharing that spirit is the most fun of all. Fred Hill and Brian Brooks are the owners of the Original Whistle Stop, Inc. 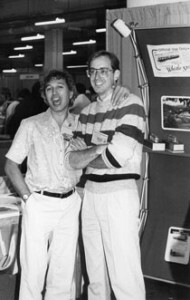 They have been partners in the business since 1983. Both men are Southern California natives. Both have had “Trains on the Brain” since they were small children. Fred and Brian carry on the legacy begun in 1951 by Ed and Irene Hakkinen. Irene ran the small shop for many years while Ed worked at the Pasadena Post Office. Model trains were a big part of the business. It was the heyday of Lionel. A little company called Varney was getting attention and a phenomenon known as “brass locomotives” was getting ooh’s and ahs from Ed and Irene’s customers. Ed retired from the Post Office in 1955 and his own model train interests soon led to the store’s focus shifting to model railroading. It was about 1958 when Fred Hill became a dedicated customer of the store, He lived in nearby San Gabriel and rode his bike the few miles up to Ed and Irene’s to get his train fix. Just ten years later Fred hired on as a part-time stock clerk at the store while attending college. Fred was pursuing a career in investment banking and found working part time for the crusty old man and his wife with the soft touch just the remedy for the stress of college and career. Fred worked with Ed and Irene along with a host of other part-timers, Wayne Lyndon, an Arcadia fireman, worked at the shop part time. Wayne performed many of the repairs and custom work for which Whistle Stop had become known. Wayne is the handsome guy next to him. In 1976, Ed and Irene were ready to hit the road in their RV and retire from the day to day responsibilities of the hobby shop. They approached Fred for assistance in finding a suitable buyer for the company. “Who better than himself”, thought Fred! So he and Wayne purchased the business. The new partners incorporated, and made official the name by which we are known today: The Original Whistle Stop, Inc.
Today there aren’t many remnants of Ed and Irene’s original store to be found at our current location. One prominent exception hangs proudly over the west front window for all to see and enjoy. 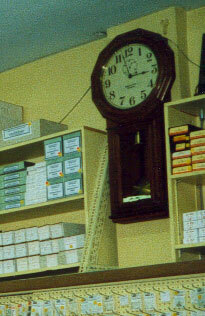 The wall clock was one of Ed’s fondest pieces in the store. He had purchased the 8-day movement Regulator from the Southern Pacific Company. It hung in the SP station in Lakewood, California. Just before the papers transferring ownership were to be signed, Ed removed the clock from the wall. That didn’t sit will with the soon-to-be new owners, and the “deal” was nearly scuttled. The actual conversation may be lost to history, but despite fuzzy memories, the phrase “No clock, no deal!” made the Whistle Stop clock as much a part of the store as anything else in it. Over the years, many other items of interest and historical significance have been added to enhance the ambiance of the Original Whistle Stop. It’s been a lot of fun adding to that collection, and sharing these pieces with those who visit us. We look forward to many more years of sharing the fun. In the next installment of The Original Whistle Stop’s history, you’ll find out how Fred met Brian. You’ll see how they have both kept The Original Whistle Stop, Inc. involved as leaders in the industry.